You can call me biased I fully admit it. But in my opinion, Columnea is clearly one of the most fascinatingly diverse genera of all Gesneriaceae! It’s not only wildly diverse, it can also be extremely beautiful. First of all, it is the largest of all neotropical (American tropics) Gesneriaceae genera in terms of the number of species, somewhere around 300. For a taxonomist this is in and of itself interesting, not to mention a lifetime or two of work to try and understand. However, for an ecologist or evolutionary biologist it also poses a number of interesting questions from the basic “why are there so many species?” to more detailed questions regarding the origin of each of the morphological traits that have emerged within the genus. For a collector of gesneriads, Columnea can be a daunting challenge, both to try and gather so many species together and to keep them alive and thriving. Columnea is found from southern Mexico to Bolivia, eastward to Amapá Brazil, and several species can be found on the Caribbean islands. Regardless of the exact geographic region where the species are found, Columnea requires a humid tropical climate where temperatures never reach freezing, or even close to freezing and humidity remains at a relatively high level year-round. 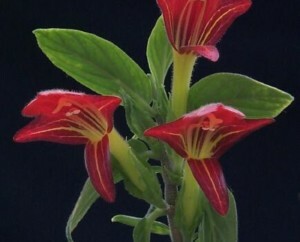 Species of Columnea are not found in seasonally dry forests, nor do most species occur at higher elevations in the mountains of Central and South America, although mid-elevations seem ideal. Most species in Columnea are epiphytes, growing on the trunks and branches of trees, often high into the forest canopy. They can be hard to find, as searching botanists haven’t often climbed the trees to look for the plants. Nonetheless, many have been collected, and entered into cultivation where they can thrive in our houses and greenhouses. Hundreds of hybrids have been created, many of which are featured on this site. You can learn more at the comprehensive article on this genus, available here or from the Articles links above. Explore, and discover the unique beauty of this fascinating genus!